Android P BETA program is now open for several devices. Here is a list of supported Android P BETA devices for different OEMs. Android P BETA program was not available since Android P DP1 but has been open after Android P DP2. This time Android P BETA is available for many Android OEMs, thanks to Project Treble for this. Android P BETA update may have many BUGs which may interfere in day-to-day usage. Enroll for Android P BETA program at your own risk. Make sure to backup all the data on your phone, as all your data may get wiped when your device is updated to Android P BETA. 1 Do I Need to Enroll for Android P BETA once again if enrolled for Android Oreo last year? 2 Do I Need to Enroll for Android P BETA if I am on Android P Developer Preview build? 3 Will my phone get OTA updates after I enroll for Android P BETA program? 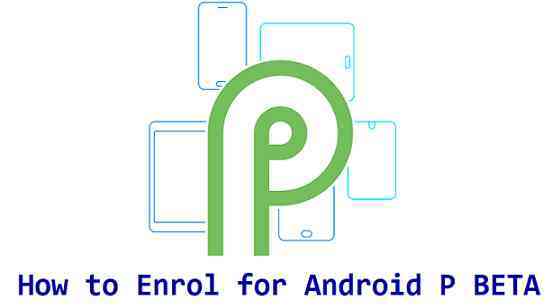 4 How to Enroll for Android P BETA program? Do I Need to Enroll for Android P BETA once again if enrolled for Android Oreo last year? Android BETA program enrollment does not carry over from older Android BETA program. You need to register for Android P BETA program once again even if you had enrolled for Android Oreo last year. Do I Need to Enroll for Android P BETA if I am on Android P Developer Preview build? If you are the owner of a Google Pixel series phone and you have installed any of the Developer Preview on your phone then your phone will not get enrolled to Android P BETA program unless you do enroll for Android P BETA program for your device. Yes you need to enroll for Android P BETA. Will my phone get OTA updates after I enroll for Android P BETA program? Android P BETA releases will be pushed via OTA updates as long as you are still enrolled for the Android P BETA program. Your device will also get the Android P public release if you still stay enrolled for that long. If you opt-out of Android P BETA program then obviously your device will not get any further updates and you need to install a stable Android OS by yourself which will wipe all the data on your phone. How to Enroll for Android P BETA program? You can only enroll/register for Android P BETA supported devices. If you don’t have an Android P BETA supported device, then probably you have to wait for longer to get either an Unofficial Android P update via a custom ROM such as LineageOS 16 or other Android P custom ROM or an official Android P build from your phone’s manufacturer. Following are the initial Android P BETA program supported devices list from Nokia, Xiaomi, Sony, Essential Phone, Oppo and Vivo. The list contains to respective OEM’s links where you need to register or enroll to get Android P BETA program updates. This list will be updated if more and more OEMs and devices added to the Android P BETA program. Subscribe to this post to know when a new device is added to the Android P BETA program. I am a Software Engineer by profession. I have worked with few big companies, such as: BROADCOM Corporation, Cypress Semiconductor, LSI Corporation, TOSHIBA Corporation; on various cutting edge technologies and product lines, such as: RAID storage Driver, SSD Firmware, WLAN Firmware etc. Having more than 7 years of experience in Software Engineering domain. Now contributing to the Custom ROMs community by bringing various Custom ROMs to the end users, developed by thousands of developers across the globe.